This is my absolute favorite cold weather treat. 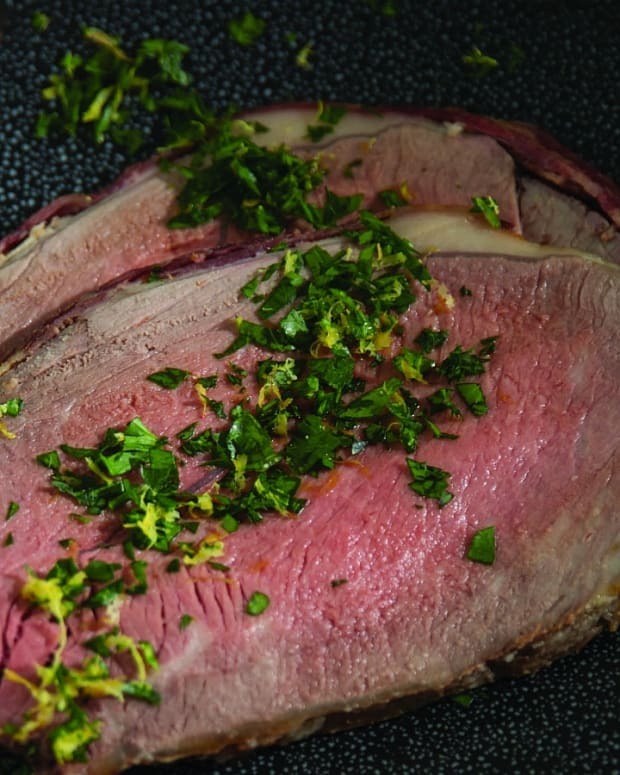 The rich braised veal combined with the bright-fresh flavors of the gremolata is a winning combination. The sparkly gremolata clears your palate and keeps you wanting more. 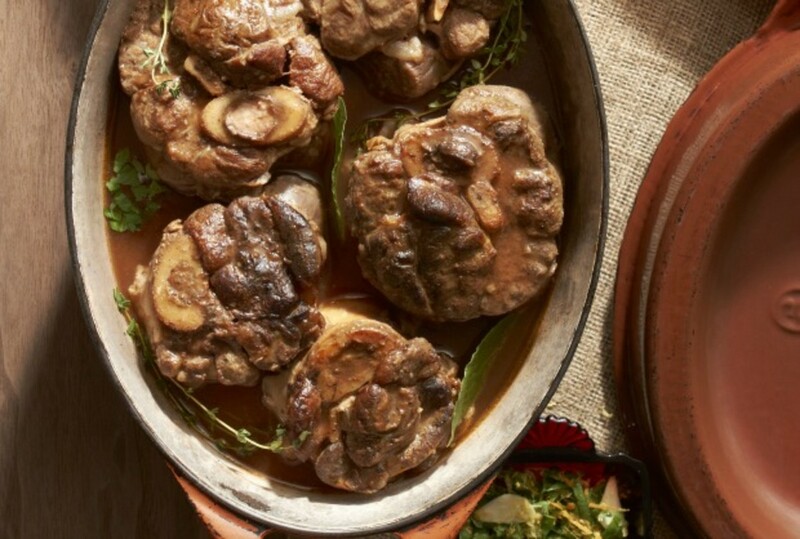 Osso buco, or braised veal shanks, can be made a day ahead of serving and can be stored and covered in the refrigerator. 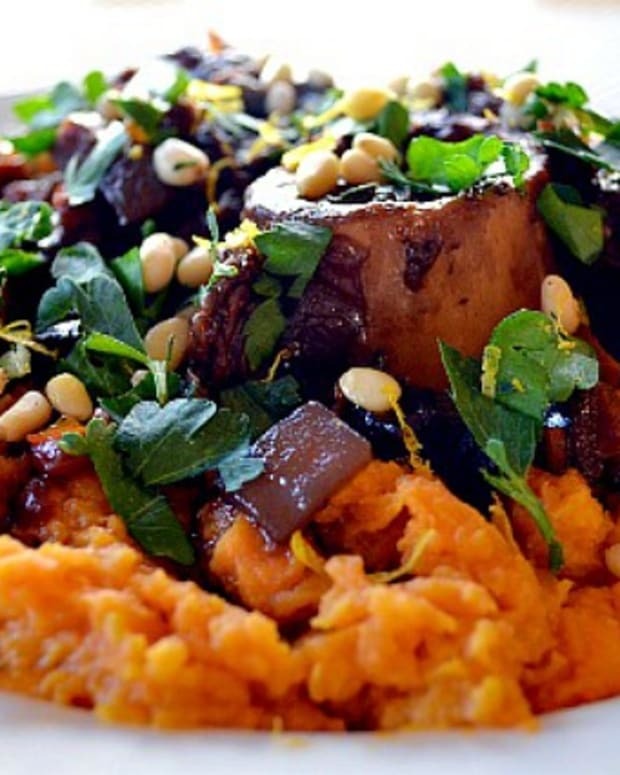 Serve the osso buco with pumpkin risotto, garlicky mashed potatoes or smashed white beans. To make osso buco in an instant pot, use the saute function on the Instant Pot to sear the meat. Remove meat from pan and saute the vegetables as recipe instructs. Add meat back into pot and pressure cook on high for 50 minutes. 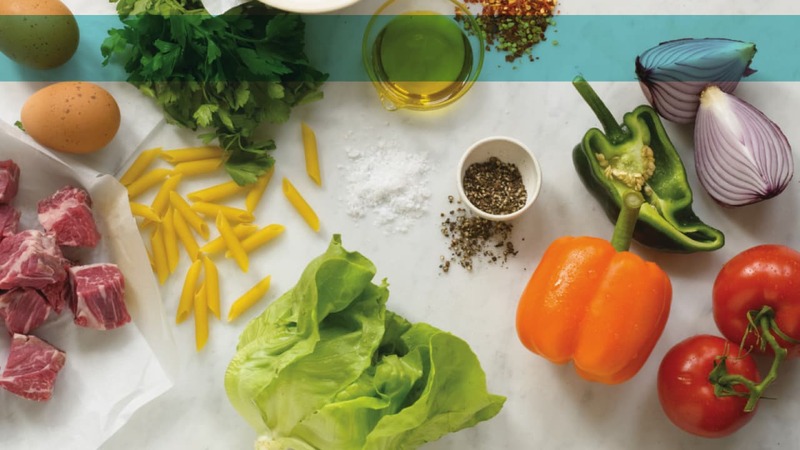 For more ways to adapt traditional recipes to your instant pot click here. 1 Preheat oven to 300° F.
2 Mix the mushroom dust with the flour. Season the veal shanks with salt and pepper. 3 Heat a large saucepan or Dutch oven to medium heat. Lightly coat the pan with olive oil. Dredge the flat sides of the veal shanks in the flour mixture. Sear each side of the dredged meat until golden brown and caramelized (about 10 minutes). Remove the veal and set aside. Brown the vegetables in batches (add more oil if necessary) until all the vegetables are browned (be careful not to over brown the garlic). 4 Add more oil to the pan and brown the tomato paste (about 3 minutes). Add the rest of the ingredients, the veal and vegetables back to the pan. 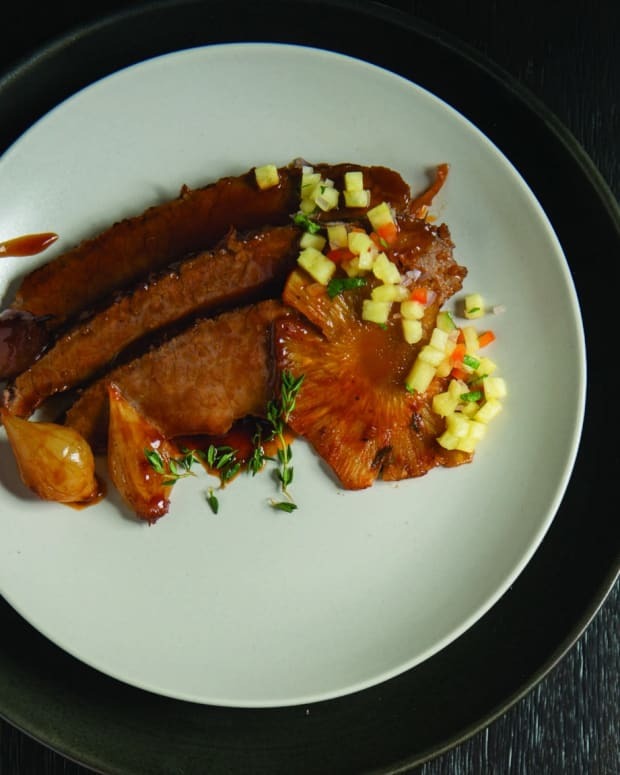 Cover the pan and braise the veal until the meat is very soft (about 2 ½ hours). 5 Carefully, remove the veal shanks from the pan. 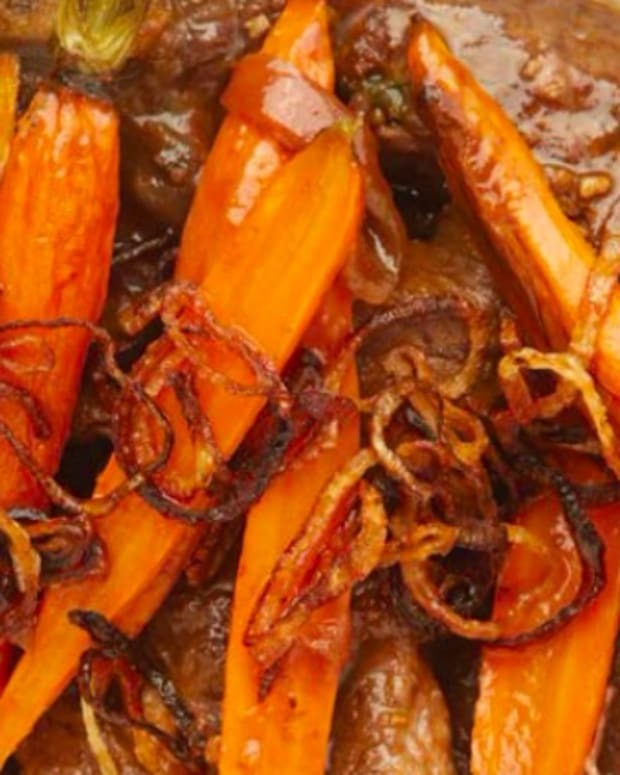 Strain the braising juices into a saucepan and press on the vegetables to get all the delicious sauce out. Discard the vegetables. 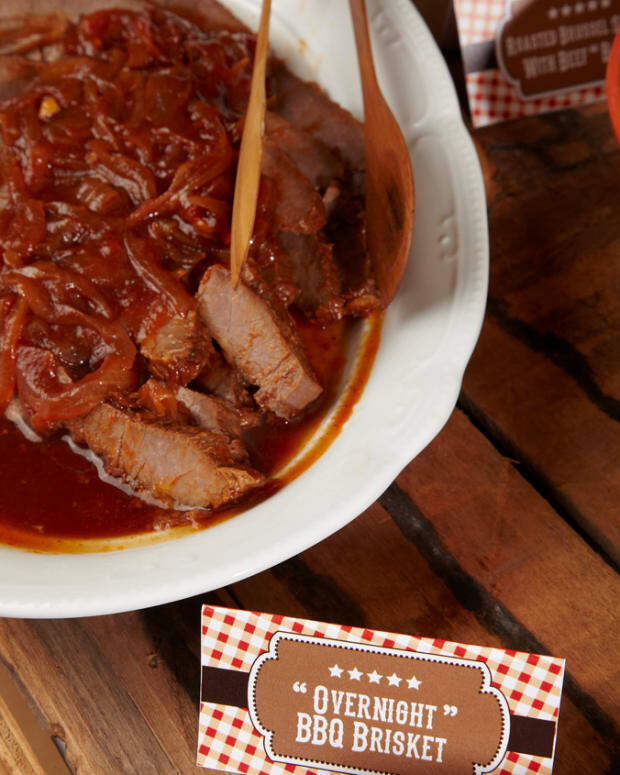 Reduce the braising liquid until it is very thick and coats the back of a wooden spoon. For the gremolata: Place the zests, parsley, garlic and olive oil in a food processor or blender. Process until the mixture resembles a coarse paste. 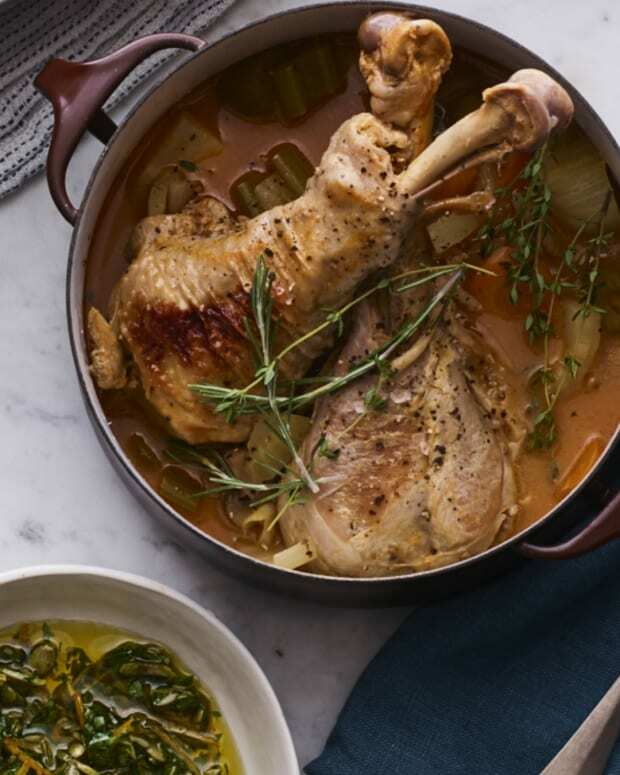 TIP: Use turkey osso buco for a cheaper, yet just as flavorful dish.